Bhubaneswar, April 7 (IANS) India Sunday successfully test-fired its nuclear-capable Agni-II strategic ballistic missile from a military base in Odisha, a defence official said. The test was conducted from Wheeler's Island in Bhadrak district, around 200 km from here, at about 10.20 a.m. by army personnel as part of routine user-trials, M.V.K.V. Prasad, director of the Integrated Test Range, told IANS. "The missile successfully hit the target. It was a perfect launch" he said. The medium-range missile with a range of over 2,000 km has already been inducted into the army, and is part of the Strategic Forces arsenal for nuclear deterrence. The Agni-II is part of India's Integrated Guided Missile Development Programme. The two-stage surface-to-surface missile, equipped with an advanced high-accuracy navigation system and guided by a novel state-of-the-art command and control system, is powered by a solid rocket propellant system. The missile weighs 17 tonnes and its range can be increased to 3,000 km by reducing the payload. It can be fired from both rail and road mobile launchers. It takes only 15 minutes for the missile to be readied for firing. The Defence Research and Development Organisation first tested Agni-II in 1999. 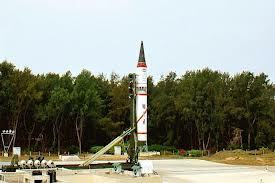 However, the Indian Army's Strategic Forces Command, which operates the missile, could test it only May 17, 2010 after two successive failures in 2009. The failed tests did not meet the mission's desired objectives as, on both occasions, the missile lost speed and deviated from its flight path. Since then, it has been successfully tested several times. The latest successful test once again proved the reliability of the missile, the official said.